Bonjour! For those of you who don't know, I spent Friday to Sunday last week in beautiful sunny Paris. I actually won a competition on Instagram (which totally made 2017 instantly better!) and I'd been excitedly counting down the days until me and my travel pal Hannah could jet off for some sunshine and pretty streets! We spent Friday wandering around and getting familiar with where we were. Luckily, Hannah/my tour guide has been to Paris seven (yes, seven) times previously so I always get a little history/geography lesson when I go away with her which is a-ok with me! We had lunch at a place called Cafe Pere & Fils which we just stumbled across and it was yum. I opted for a chicken burger with fries (you have to, right? ), pale rose wine and Hannah got a goats cheese and honey salad which was so good, I had extreme food envy! Scroll down for pics of that one. The streets of Paris are lovely to walk around though, even if it as a whole didn't totally blow me away. It sort of reminded me of London in size and sprawl and each area was nice, but I couldn't quite pick them out from each other. However, I did enjoy how beautiful everything was. 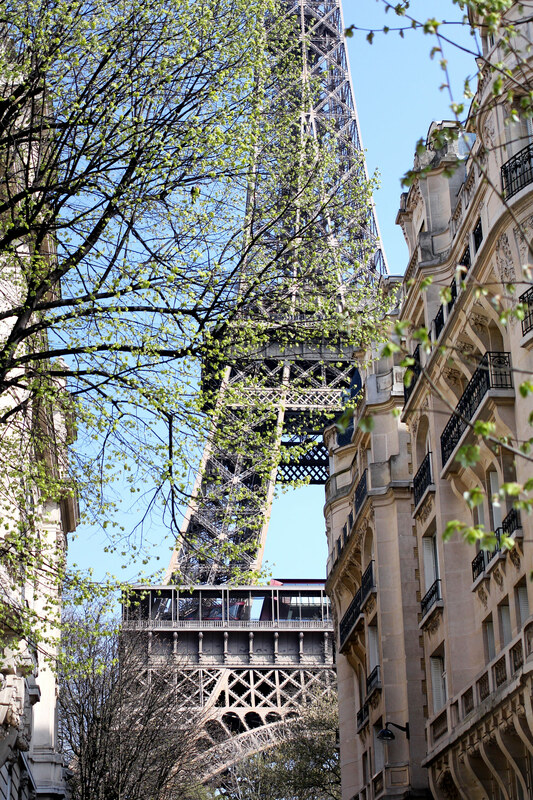 Paris in the springtime is such a gorgeous sight. There's hints of blossom and flowers everywhere, there's greenery on people's balcony's and bunches of blooms in the shops - it really is dreamy to wander around. Anyway, on Saturday we did intend to go to the Eiffel Tower but didn't quite get there! We walked by the Notre-Dame (the queues to get in are insane!) and to the famous Shakespeare bookshop where I bought a sweet second-hand coffee table book. We went for a pre-arranged lunch at a place called Jaja which is tucked away and very chic looking, with lots of black, white and greenery. I'll be honest, I didn't quite enjoy my lunch there as the seafood pasta I had wasn't quite to my taste, but the bottle of wine went down a treat and the starter was decent. I also went to the famous Angelina for hot chocolate and cake which was yum! I'll be honest, if you get to go to Caffe Florian in St Marks Square in Venice, their hot chocolate is 10x better, but Angelina comes in close second. Their delice au caramel tart was delish, the perfect combination of vanilla, a crispy base and a salted caramel sauce. Hannah went for religieuse cassis-vanille which was a choux base with vanilla and blackcurrant. Everything was so beautifully presented and very special looking, so it was a lovely treat to have. On Sunday we went to the Eiffel Tower because you have to, right? It was busy but we managed to get some snaps so I was pretty happy. We had to laugh though, as every time we decided to take a photo, there would be three or four people would do the same, at the same angle. Influencers, through and through, eh ;) I wish I could have went up, but the queue was completely insane so it was fine staying on floor level. I'm just so glad I got to experience Paris and saw the things I wanted to see. The weather was gorgeous too! I took a few outfit snaps which I'll share in the next post, so keep your eye out for them.